The ESPN app is available on Roku, providing viewers with live streaming access to ESPN networks, ESPN+, live events, and ESPN shows. If you're having trouble activating ESPN on Roku, we offer complete instructions below on how to add ESPN to your Roku channel list and how to activate the channel to watch live TV broadcasts of ESPN networks and sporting events. Live streams of ESPN's U.S. networks and on-demand access to full episodes of popular ESPN shows are available to those who subscribe to a participating pay TV provider, including some streaming TV services like Sling TV and Hulu Live, with a level of service that includes ESPN. To see if your provider allows access, you will need to install ESPN on your Roku and attempt to link your device (see instructions later in this article). 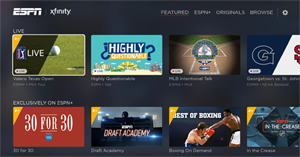 Subscribers to the ESPN+ service can watch live sports, original content, and on-demand programming. Cordcutters who don't subscribe to the ESPN+ service or to a pay TV service can get sports scores and watch news, video highlights, and clips, features and analysis. If you have not already done so, you will of course need to add ESPN to your Roku TV or Roku device. You can add ESPN through your Roku device or through your computer or mobile device. Install ESPN through your Roku device - You can find ESPN by browsing through the Sports category after selecting Streaming Channels from your Roku's home screen. However, it may be faster to search for the channel. Select the Search option from your Roku's home screen, then start typing "espn." ESPN should appear as a result before you are done typing it in. Highlight ESPN, press OK on your remote, then select Add Channel and press OK again. Now return to your Roku's home screen and ESPN will be at the very end of your channel list. Install ESPN through a web browser - You can add ESPN through the Roku website at channelstore.roku.com/details/34376/espn. Simply go to that link and click the Add Channel button. If you are not already logged into your Roku account, you will be prompted to do so. Open the ESPN channel on your Roku. From the channel's home screen, scroll to the gear icon in the menu bar at the top of the screen to access the Settings menu. Go to espn.com/activate on a computer or mobile device. Enter the activation code shown on your Roku and click the Continue button. On the Choose Provider screen, select your cable, satellite, or streaming TV service provider. You will be asked to sign in with your TV service provider credentials. If you don't know your user name and password, you will need to contact your provider for them. select ESPN Account >> Log in to your ESPN account. Go to es.pn/roku on a computer or mobile device. Log in to your ESPN+ account. If you're not already a subscriber, you can get a free ESPN+ trial here. The ESPN channel should automatically activate or log you in within a few seconds. If you have more than one Roku, ESPN will be added to every Roku on your account, but you will need to activate ESPN on each Roku by following this process for each device. FAQ #1: My TV provider is not listed, so how do I activate ESPN? - Sorry, but you cannot activate ESPN if you do not subscribe to a pay TV provider that allows their customers access. FAQ #2: Will I be charged for ESPN when I activate it? - No, ESPN is free to those who already receive ESPN networks through participating TV providers. FAQ #3: I don't subscribe to any pay TV services; can I purchase an ESPN subscription? - No, ESPN is not currently available as a paid subscription. It is only available to those who pay for ESPN networks through a participating TV provider. However, you can subscribe to ESPN+, but it does not offer the same content as you get when you authenticate through a pay TV provider. FAQ #4: Can I activate ESPN if I subscribe to a participating TV service provider, but my subscription does not include any ESPN networks? - Your TV subscription must include ESPN in order to activate live TV on ESPN. FAQ #5: Sling TV is listed as a pay TV service that allows authentication. Why can't I activate ESPN if I subscribe to the Sling Blue service? - Sorry, but ESPN is available only to those Sling TV subscribers who have the Sling Orange service, which includes ESPN. Sling Blue carries FOX Sports instead of ESPN. FAQ #6: Will I be charged for ESPN+ if I install the ESPN channel on my Roku? - No, installing and launching the channel does not result in any charges. You will charged for ESPN+ only if you subscribe, which you can do by selecting any video with the E+ icon in the corner of the thumbnail. And if you do subscribe, you have a 7-day free trial; cancel before the end of the trial to avoid any charges. RokuGuide.com is an independent website that is not affiliated with Roku, Inc. If you need additional help activating ESPN on your Roku device, please contact Roku Support or ESPN Support.